Getting stranded with a flat tire is a frustrating set-back when trying to get somewhere. However, with a little practice, fixing a flat can be done in a matter of minutes with minimal grease or tools. Step 1) Take the wheel off the bicycle. 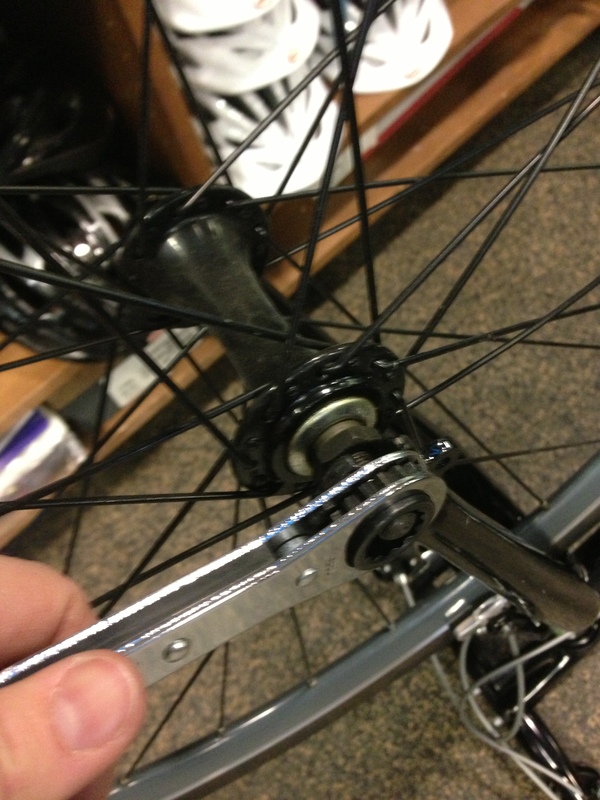 Loosen the nuts or quick release that hold the wheel on the bike and remove the wheel. (Make sure any nuts you take off are somewhere safe!) If your rear tire is flat, you’ll need to make sure to take the wheel off the chain. Step 2) Remove the tire from the rim. Use the tire lever to wedge the tire from rim by hooking the round end under the edge of the tire. (You can use two levers for this, but I find one to be enough.) Once you get the lever under the tire work it around the wheel until the entire side of the tire is out. Do the same on the other side. Find the valve and push it up through the rim. Remove the tire and tube completely from the rim. Step 3) Check the tire for debris. Look and carefully run your fingers along the inside of the tire to make sure that whatever popped the tube is not still lodged in the tire. Step 4) Put the new (or patched) tube in the tire. Place the tube inside the tire with the valve pointing in. Make sure the tube lies flat without any twists. It may help to put a little bit of air in the tire first. Step 5) Put the tire and tube back onto the rim. Line up the valve with the hole on the rim. Ease one side of the tire back into the rim, being careful not to pinch the tube between the tire and the rim. Guide the valve through the hole so that it is angled straight (an angled valve can lead to another flat or problems pumping). Step 6) Ease the other side of the tire into the rim. Using your hands and tire levers (although the video above doesn’t recommend it), ease the other side of the tire into the rim. Once both sides are in the rim, look over the edge on each side to make sure the tire is evenly and snugly fit into the rim. Step 7) Pump the tire. Use a pump to fill the tire to the pressure indicated on the side of the tire. If you don’t have a gauge on your pump, fill your tire until it barely gives when you push it with your thumb. Step 8) Put the wheel back on the bike. Replace the wheel on the back making sure any quick releases and nuts are tight. If you removed the back tire, make sure the chain is returned to it’s original position.